Interfolio Faculty Search uses a hierarchical structure of organizational units. One unit is at the top of the hierarchy, such as a university, and other units are set up within or under the higher unit, such as schools or colleges, which can in turn contain lower units such as departments etc. This structure is used to determine many settings and permissions in the program. 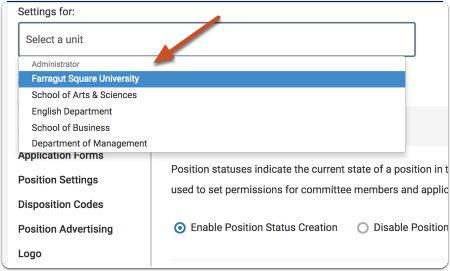 Faculty Search can be set up to exactly mirror the organizational hierarchy of your institution, or any way that best fits the workflow of your organization. Any organizational structure is possible, and administrators can add a unit at any point in the hierarchy. 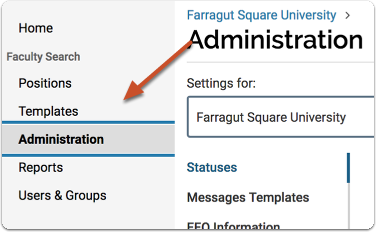 As an administrator, you will have control of the settings for units at or below your level of access. This article explains how to set up Faculty Search to mirror the structure of your organization. 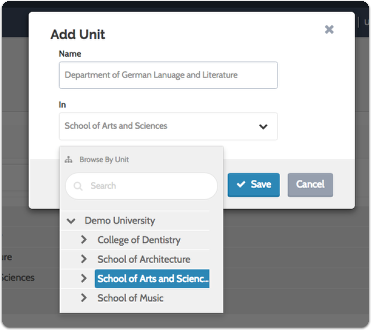 Enter the unit name and select the larger organizational unit to which it belongs from the dropdown menu, and click "Save"
Best Practice: Use the full name of the unit in your institutional hierarchy as this value will appear on the landing page of every search. In the example below, we have added a Department of German Language and Literature to the School of Arts and Sciences. You can add as many organizational levels as necessary. For instance, the Department of German Language and Literature could contain a smaller unit such as a major area of study. 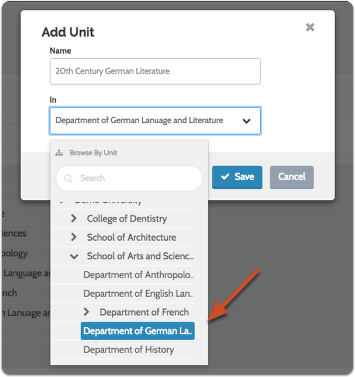 In the example below we have added "20th Century German Literature" beneath the Department of German Language and Literature. Make sure you are editing the settings for the unit you want to manage by selecting the correct unit from the drop down menu. 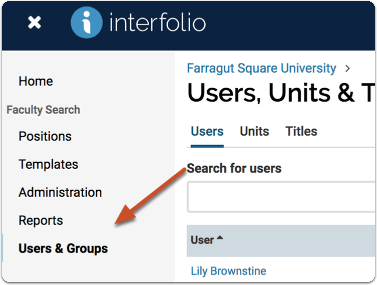 Note: If you have more than one role in Interfolio Faculty Search, or serve in more than one unit, make sure you have the correct unit selected. For instance, if you are an administrator in a unit, but also serve as a committee manager for a position, make sure you select the correct role. Likewise, to edit a different unit, select the unit from the drop down menu.